Crazy busy week and all cramped in one little post. 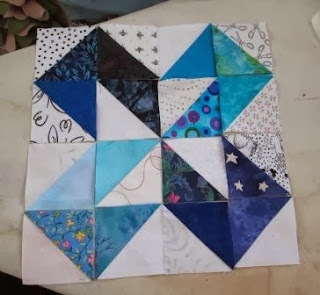 I did get some light Blue scraps done for my Rainbow Scrap Challenge 2013. I worked on the Jack in the Box blocks. I got four blue ones and one Red on done. I still need a few more red ones. I am also trying to get all the spools done. 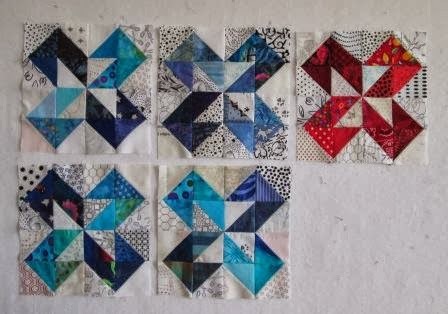 So a few blue ones but then a mix of other colours. 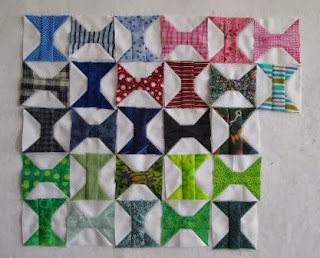 I have added this post to Soscrappy Saturday's linky party. Wednesday was our 20th anniversary and my husband got me Roses. Then Friday was my birthday. 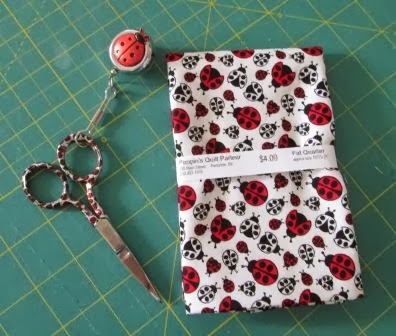 My mom gave me a cute fat quarter with lady bugs and matching scissors with a zinger. Just one of my gifts. This is the start of the month of Cake. We have a few more birthdays in the family with in the next three weeks. I am trying to get some binding done. 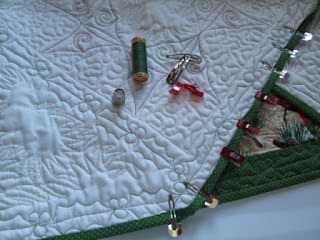 I have quilted a few of my projects over the past month and now it is binding time. We have the Leduc Black Gold Quilt Patch Quilt Show in Oct so it is get it done time. I have added this to Kathy's Quilts for slow Sunday stitching. We had a little frost this week so today was time to get all of the garden in. Here are some tomatoes and squash. "the month of Cake" love that~! happy belated anniversary and birthday. bindings are one of my favorite things to do. easy work and definitely a sign that you have almost finished a project. A busy week! Happy anniversary and happy birthday and wishing you many more of both! Happy Anniversary -- and Happy Birthday too! I like the idea of a "Month of Cake" (grin). Hope I can get up to the quilt show to see all of your wonderful work. 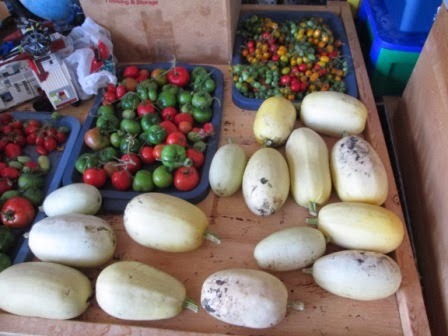 What a beautiful crop of tomatoes and squash- you are going to have another busy week. 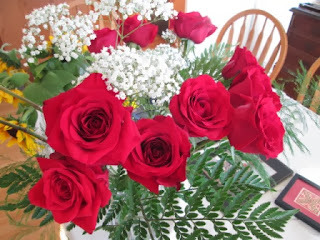 Happy birthday and anniversary- lots of things to celebrate. Happy belated Anniversary and Birthday. Love the shot of the veggies.......yummy. I had a friend who celebrated the whole month of her birthday. It was lots of fun. I don't think I have ever seen that block. Very interesting and I love the name Jack in the box. What a special week...an anniversary, a birthday, some harvest veggies, and some hand stitching time! Love the lady bug fabric..I have used that very fabric in a red and white quilt.Happy Birthday and Happy Anniversary!! !